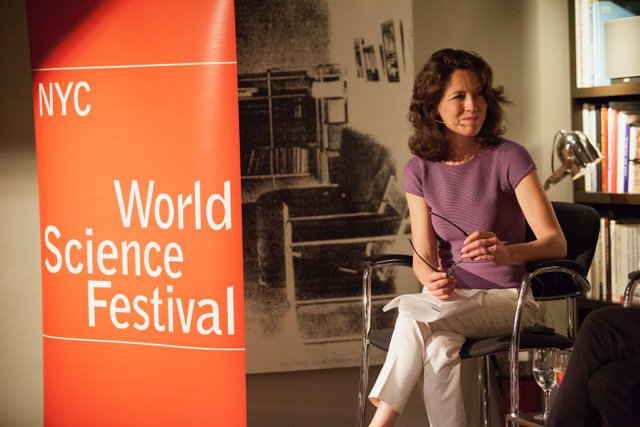 The world science festival chaired by Emmy Award winning journalist Tracy Day & her husband, renowned physicist Brian Green was held in NYC from May 29th through June 3rd this year. This annual event brings inspiring minds in science from all around the United States for a week long immersive STEM experience for the public. I had a chance to catch up with Tracy Day, the CEO & co-founder of the World Science Festival during a visit to NYC. What was the inspiration behind the world science festival? I’m a journalist by profession and covered mostly broadcast journalism. I met my husband Brian on a Peter Jennings project, a 12-hr documentary series where I found out that scientists were interesting than I thought. Mainstream media didn’t give due credit to scientists at that time! My husband & I heard about this science festival in Italy and we thought what a great idea & is there a possibility to bring this kind of concept to the USA. It became clear that given the right number of tools and really good story telling, there is huge amount of possibility here to bring high level science to a large audience. How much influence do you think the Science Festival has had so far? When we started in 2008, we weren’t sure if anyone was going to show up. Have we changed the way people view science? If you look out these doors, there’s people waiting in lines to attend science shows like music festivals. Wow, that’s a science event! That’s the kind of wonderful sense you have had impact and the general just repositioning science in the center of popular culture. Another key impact is that scientists are typically not outward facing, they have come to trust that this sort of communication is important. We have been doing this for almost 11 years, and we tend to program for different audience, we have stories of people who were kids when they first attended the festival and they are now postdocs and pursuing careers as scientists. What have you learned along this journey? You have this great idea and with all this excitement you just throw yourself into it & you are figuring it out as you go! We launched with a high-profile festival in 2008, with about 120,000 people attending the event. Then we had to be grown ups and build the organization from the ground up and figure out how it can survive. We are completely independent, and we produce the funds and we are unlike any other festival that we don’t curate the content. Why did you pick NYC to hold the Festival? Our friends & colleagues discouraged us from having the festival in NYC due to the buzz and the energy of the city, however we looked at the city as a palette with lot of great opportunity. Started in New York but was never intended to just be in NY, since it is supposed to be a world science festival. We currently have world science festival in Australia and we will continue to expand, also our digital and theatrical works as well. What are some future projects you are working on? We have several things in the pipeline, one is a national PBS special that will happen in 2019; a theatrical work on the discovery of Einstein’s theory of relativity. We also have an orchestral piece called edge of time that is in the works. Also, Brian is currently writing another book. Of course, we are busy with the preparation for the festival for the next year as well as expanding into other areas. Someone like Arianna Huffington of course, she makes things happen! I respect when people break new ground, I am not a person who is not all that interested in stepping into something that is already in place and just executing another person’s playbook. I’d rather create it myself and take a risk. I was in a generation that saw strong women who were paving the way and that was huge for me. I grew up looking at feminists as role models and leaders. Some advice for our readers? If you have the good fortune of just having a good idea and pursuing it professionally and seeing it happen, it is the most rewarding thing. I like feeling good about what I am working so hard to accomplish. (Laughs) excellent question! I would be hesitant to advice any one to do that but it works in our case as we are utterly compatible in life & also work. Miraculously it works perfectly for us. Our professional lives & personal lives are so intertwined and utterly complimentary. We have different strengths and deep respect for each other’s abilities. It works! We love it! Unfortunately, our children has to live with us devoting ourselves to our passion project every day!